Unlike Dolly Parton’s coat of many colours, those of our Cavaliers are inherited from both their parents! I hope on this page to explain how and why, and to provide a colour chart which will show what colour coats can be inherited from different coloured parents. I have written this up both to clarify in my mind the information that I have collected, and in the hope that it may also help other people’s basic understanding of the subject. At the bottom of the page there is a form for adding your comments, criticisms and corrections. These will be added directly to the page when you submit the form. Any other colour or combination of colours most undesirable. In the early days all colours were recognized, but later modifications to the standard reduced the permitted colours, until we ended up with the four we have today. eumelanin which is dark, though it can vary somewhat in colour due to variations in the pigment. The base form of melanin is black. phaeomelanin which gives cavaliers their red (ruby and Blenheim) colouring. The type and distribution of colour in the coat is determined by the dog’s genes. There are at least two and possibly as many as four gene series that determine where on the dog, and along the length of its hair, eumelanin and phaeomelanin appear. Genes are made up of DNA and control the transmission of hereditary characteristics. The visible expression of such characteristics – for example coat colour – is called the phenotype. The genotype is the actual genetic makeup of the individual dog, and may differ from the phenotype, although in some cases the results that we can actually see would appear to be the same. Any given gene occupies a specific place on a specific chromosome; this position is known as its locus (plural, loci: from the Latin, meaning place). By finding the locus of a gene, it can be isolated, and studied to discover its function or purpose. Genes may be dominant or recessive. Dominant genes are strong: their functionality takes precedence over any recessive gene where one of each type appears together, so only one dominant gene is required to display its particular characteristic. Recessive genes are weak so they must exist in matched pairs to display their particular characteristic. 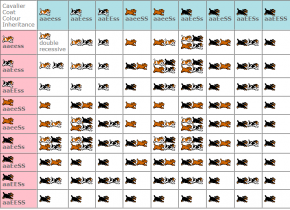 Many gene types also have their own subset of variations, which are known as alleles. These may occur in both dominant and recessive genes. Current research is identifying more colour genes, and in some cases, suggesting that earlier classifications of some variations may be incorrect. at, which produces black, with tan markings on the muzzle, over the eyes, on the chest, legs, and under the tail. This determines the patterning in our Black and Tan, and in conjunction with sp our Tricolour Cavaliers. S, solid color. This is the normal allele in coat colours without white markings. An SS dog can completely lack white, but it can also express very minor white markings – white toes, white tail tip, or a star or streak on the chest. So this can result in mis marking in our Wholecolours (Ruby, Black and Tan). sp, piebald. This causes the “broken” coat patterns in our parti-colour Blenheims and Tricolours. The brown series gene, B, is also carried by all Cavaliers; they are of concern only if you get a light-eyed, liver-nosed blenheim (bb instead of BB), or a chocolate tri or chocolate tan (Bb) in a litter. Another gene that is of possible interest is the ticking gene T, as occasionally a Cavalier may carry the dominant form of it. A puppy inherits two colour genes - one from each parent, and two pattern genes – one from each parent. Depending on their colour, the parents can pass on some gene combinations, but can never pass on others, as they just don’t have them in their genetic make-up. The combination of these inherited genes will determine whether the pup is Black and Tan, Tricolour, Ruby, or Blenheim. Blenheim: is a combination of a red coat ee and a parti-colour pattern spsp. Our Blenheim puppy can only ever have the gene combination atateespsp. He has to have two genes for red and two for piebald/parti-colour, as explained above – so no other options are possible. Ruby: is a combination of a red coat ee and a solid colour pattern – which can be either SS or Ssp. So a Ruby puppy can come in two flavours, depending on which combination of solid colour pattern genes he receives: so he can be either atateeSsp or atateeSS, but he will look exactly the same! Tricolour: is a combination of a black coat, which can be either EE or Ee, and a piebald/parti-colour pattern gene spsp. So a tricolour puppy also comes in two flavours, this time depending on the combination of the black coat colour genes that he receives: he can be either atatEEspsp or atatEespsp but he also will look exactly the same! Black and Tan: is a combination of black coat colour and solid colour pattern genes. Our Black and Tan puppy has the most complicated gene combination options: because he has dominant (strong) genes for both coat colour and pattern he can come in four different flavours! His black coat can come from either the pair of genes EE or Ee, and his solid coat pattern genes can be either SS or Ssp. So this complex little pup can be atatEESS, atatEESsp, atatEeSS or atatEeSsp. And once again you will not be able to tell from his coat which combination of genes he has received! 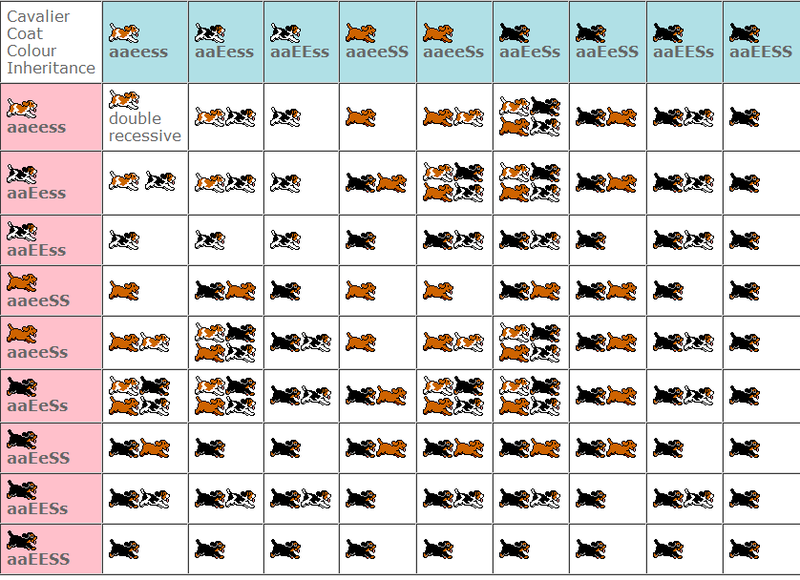 Use the table below to find the possible litter colours that you could expect to see from a given mating. But please be aware that you will not necessarily get all these colours, as it depends entirely upon which of the genes each parent actually passes on to each puppy in the litter! The only guarantee is for the colours you won’t get! You can refer either to the gene combinations or use the colours to choose your parents from the table. But please note: with Blenheims what you see is what you get, they have all recessive (weak) genes for their colour and markings, and have only one set of gene combinations. All other Cavaliers can have more and since the differences between them are not visible in their coats, you may need to use other methods to determine what they actually are. Please note: for brevity at has been abbreviated to a, and sp to s.